Beauregard Burnside III, Chris Goose, Romberg Rabbit, Garfield Goose, Mackintosh Mouse and Frazier Thomas on Garfield Goose and Friends. William Frazier Thomas (June 13, 1918 – April 3, 1985) was a Chicago television personality. Although Thomas wrote nine children's books, he was best known for creating, hosting, writing and producing the long-running children's television program Garfield Goose and Friends on WGN-TV. Thomas began performing as a magician at age 12 in his home town of Rushville; he was just a teenager when he wrote a book about magic. As "Thomas the Magician and Company" he performed "the Mystic Revue, a full evening of magic, mirth, music and mystery" throughout the US. By 1935, he was writing a weekly syndicated newspaper column for children about magic, at first as "Thomas the Magician" and later as Frazier Thomas. The tips and tricks Thomas covered in his column were simple enough for young readers to perform successfully. His column appeared in newspapers from 1935 to 1940. Thomas was a member of the Society of American Magicians and attended their national conferences. By 1936, Thomas had an additional interest: radio; he became the host of a summer replacement show about movies for Cincinnati radio station WLW. A year later, he interviewed Edgar Bergen and became interested enough in ventriloquilism and dummies to visit the Chicago workshop of the man who produced Charlie McCarthy. Thomas and Ruth Lyons at WLW Radio's Morning Matinee, 1948. Taken from a station-issued promotional calendar. He continued working at WLW, writing and creating his own shows: I Cover the Movies and Inside Radio and as a disk jockey for others, such as BC Battle of the Bands. He was then teamed with Ruth Lyons for Collect Calls From Lowenthal. Still at WLW, the pair moved to a morning radio show, Morning Matinee (later called The 50 Club), which Thomas co-hosted with Lyons for eight years. During this time he also did personal appearances with other WLW air personalities, serving as the announcer and as a magician. In 1949, he announced he would leave Morning Matinee to establish his own radio and television production firm. He married Ann Deeds, a commercial artist for WLW-TV, and together the couple hosted one of the station's first television shows: Shopper's Special. Thomas then moved to Cincinnati's WKRC-TV, where he hosted his first children's program, Meet the Little People. In 1950, Frazier and Anne Thomas were among the top local television personalities in Cincinnati. Garfield Goose made his first television appearance in Cincinnati. Ad for the show before July 1953 when WBBM-TV began to broadcast as Channel 2. Thomas had the idea for Garfield Goose from attending bazaars as a boy. The local Catholic nuns used a sock puppet made into the form of a goose to ask children for charity donations. The children would "feed" the goose their pennies. He came up with the idea to use a goose puppet on his television show for giving prizes to children. The name of the goose was taken from the telephone number of the television station; at the time, all telephone exchanges had names as well as numbers. The name of the telephone exchange for the television station was Garfield. In 1951, Thomas was hired by Chicago's WBKB-TV (now WBBM-TV) for an afternoon variety show initially called The Frazier Thomas Show. He also put in some time as the host of an evening music program, Musical Nite-cap. Thomas' afternoon show was renamed Petticoat Party; his announcer for it was Ray Rayner. Garfield Goose made his Chicago debut on Petticoat Party. It was not long before the station saw that Thomas and his goose puppet were the most popular parts of the program. On September 29, 1952, Frazier and Garfield went on their own in a show called Garfield Goose and Friend; the show went on the air directly opposite NBC's Howdy Doody. This was a time of great transition in Chicago television; WBKB, which was broadcasting on Channel 4, changed its management, frequency and call letters to being owned by CBS, broadcasting on Channel 2 and now known as WBBM-TV. The new WBKB-TV was now broadcasting on Channel 7 and owned by ABC. A clause in the contract for the WBKB sale to CBS called for all programs currently on the station to remain on the air for one year after the sale. Before the transition period was over, Thomas and his goose moved to the new WBKB, now under ABC's management. One year later, in 1955, the pair found their permanent television home at WGN-TV, where they would be joined by the other characters, making it Garfield Goose and Friends. With the show's popularity among young viewers in the Chicago area by 1953, Thomas produced a book for them, Garfield Goose Memory Book. Thomas told the story of Garfield Goose from his youth, including information about his family and his average day in the castle. Roy Brown illustrated the 32-page booklet, which was also intended to be used as a coloring book. In addition to entertaining, Thomas also educated his young viewers, but never with a heavy hand. His guests were people like Dr. Lester Fisher of Chicago's Lincoln Park Zoo and J. Bruce Mitchell of the Museum of Science and Industry whose visits were both fun and informative. Thomas also had a Hobby Corner feature where children would talk about and display things they were interested in. There were also subtle moral messages when Thomas needed to explain to Garfield why something he had done or wanted to do was wrong. During the holidays, Thomas sang "Jingle Bells" in Latin, teaching the words and their meaning to his television audience. Children and their parents were invited to write for a copy of the words; it took Thomas weeks to mail all the replies. On occasion, Thomas would take his Jew's harp from his pocket and begin to play. His goose friend would respond to the music by either retreating to another part of his castle or hitting Thomas on the head with his beak. He also visited local schools to perform magic shows. The Chicago chapter of the National Academy of Television Arts and Sciences did not begin awarding local Emmys until 1958; Thomas was the first winner of the award for Male Best Children's Performer, and won the award again in 1964 for his work with Garfield Goose and Friends and Family Classics. Frazier and Garfield join Bozo's Circus in 1976. Roy Brown (Cooky the Clown) and Bob Bell (Bozo) are also pictured. In 1961, WGN-TV had an extensive library of films which were suitable for family viewing, but were rarely aired. Fred Silverman, who was a WGN executive at the time, came up with an idea for putting the films to use. He wanted to air them when children and their parents could watch and enjoy them with Frazier Thomas as the show's host. Thomas agreed to host the program provided he had editing rights on the films, was able to choose them himself and also to refuse any titles he believed were not suitable for the show. A set designed by Thomas that resembled a cozy home library complete with a Roy Brown painting of Garfield Goose was built and he began his Family Classics weekly show on Friday evenings. Family Classics became so successful, it was beating many of the network programs in the Chicago market. The networks responded by purchasing new movies to air in the same time slot; this made it necessary for the program to move to Sunday afternoons. The Family Classics set is now part of the Museum of Broadcast Communications' collection. Thomas also brought a movie camera on his vacations and the footage he shot became specials for the station. The Thomas family's vacation on an 85 foot schooner became Sailing the Seas of Columbus and their trip to England resulted in The Legend of Arthur, the Phantom King. By the 1970s the way Chicago children watched television had changed, and Garfield Goose and Friends moved to mornings on WGN. When Ned Locke, ringmaster of Bozo's Circus retired in 1976, Thomas was asked to become his replacement. This meant that the show would combine with Bozo's Circus; Garfield Goose and Friends last aired on September 10, 1976. Frazier's friends were off the air permanently on January 26, 1981, after changes to the Bozo program. He continued to work on the show as the circus manager and to host Family Classics. Thomas suffered a stroke at the WGN-TV studios on April 1, 1985 and died on April 3, 1985. He had hosted the local Easter Seals telethon the day before he was stricken. He was survived by his wife, Ann, his daughter, Kitty, and his son, Jeff. Thomas received the Chicago Academy of Television Arts and Sciences' Governors' Award for his television work posthumously in 1985. The Thomas family donated Garfield and the rest of the puppets, along with Thomas' uniform, to the Museum of Broadcast Communications. The 2500 block of West Bradley Place in Chicago in front of WGN-TV's studios is honorarily named "Frazier Thomas Place" in his memory. 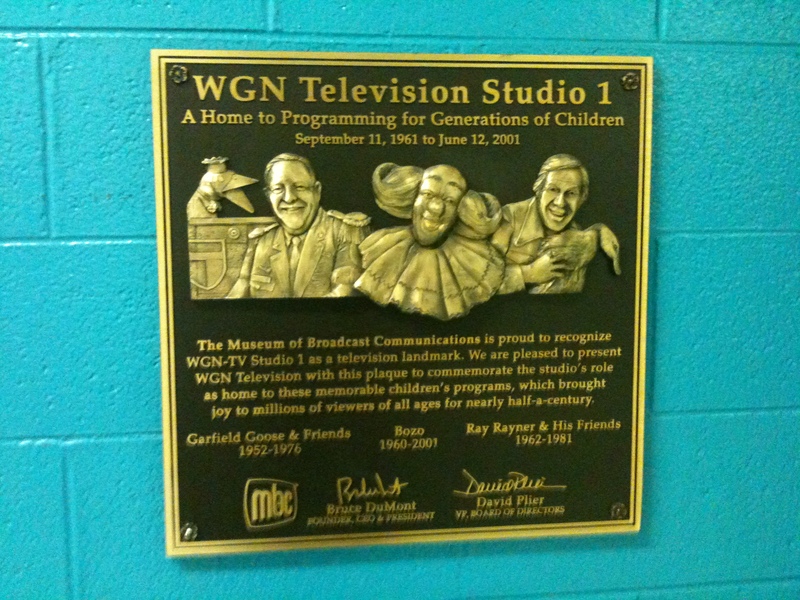 In 2005, the Museum of Broadcast Communications awarded WGN-TV's Studio 1 a plaque to commemorate the forty years of children's television broadcast from the studio. Garfield Goose and Friends with a likeness of Thomas and Garfield, is on the plaque along with Ray Rayner with Ray Rayner and Friends and Bob Bell and Bozo's Circus. ^ Polack Starts Well On Cincy Stand. Billboard. 21 February 1948. Retrieved 12 March 2011. ^ a b c d e f g h i j k l m n "Frazier Thomas". Chicago Television. Retrieved 6 February 2011. ^ a b c "Popular TV Children's Show Host Dies". Times-Union. 4 April 1985. Retrieved 7 February 2011. ^ a b "Frazier Thomas to Visit Area". The Daily Sentinel. 31 July 1977. Retrieved 10 February 2011. ^ "Thomas The Magician Started Study Of Magic As Mere Boy". Lewiston Evening Journal. 16 November 1935. Retrieved 12 February 2011. ^ Thomas, Frazier (1 March 1940). "Rising Card Is A Neat Trick Which Earns Girl A Prize". The Owosso Argus-Herald. Retrieved 12 February 2011. ^ Thomas, Frazier (19 August 1939). "Crowds Follow Magicians Hoping To See Impromptu Performances". Saskatoon Star-Phoenix. Retrieved 12 February 2011. ^ a b c d e f g Okuda and Mulqueen 2004, pp. 51-66. ^ Thomas, Frazier (16 October 1937). "Famous Dummy Of Edgar Bergen Has Been Big Success On Radio". The Owosso Argus-Press. Retrieved 12 February 2011. ^ Banks, Michael A., ed. (2009). Before Oprah: Ruth Lyons, the Woman Who Invented Talk TV. Orange Frazer Press. p. 260. ISBN 1-933197-49-8. ^ "Rushville Suburb of Bentonville, Morning Radio Audience Learns". National Road Traveler. 25 July 1946. Retrieved 10 February 2011. ^ "Bentonville Woman Dances With Frazier Thomas At Morning Matinee". National Road Traveler. 15 July 1948. Retrieved 10 February 2011. ^ Thomas Quits WLW To Set Up Own Firm. Billboard. 26 February 1949. Retrieved 12 February 2011. ^ Mills, Maryann Traficante (22 September 1993). "Bereavement Counselor Helps Survivors Deal With Grief". Chicago Tribune. Retrieved 18 February 2011. ^ a b Okuda and Mulqueen 2004, p. 53. ^ a b c Feder, Robert (2 May 2010). "Remembering a Chicago Classic:Frazier Thomas". WBEZ Radio. Retrieved 6 February 2011. ^ Billboard Compiles List of Top Local TV Talent. Billboard. 18 November 1950. Retrieved 12 March 2011. ^ a b c d e f Heise, Kenan (4 April 1985). "Frazier Thomas, TV Kids' Pal For 35 years". Chicago Tribune. Retrieved 18 February 2011. ^ Okuda and Mulqueen 2004, pp. 51-53. ^ Okuda and Mulqueen 2004, pp. 3, 51-53, 56. ^ "Changing Channels Part IV". Chicago Television. Retrieved 20 February 2011. ^ "Changing Channels Part V". Chicago Television. Retrieved 20 February 2011. ^ Library of Congress. Copyright Office (9 November 1953). Catalog of Copyright Entries. Third Series: 1953: July-December. Retrieved 12 November 2011. ^ Mueller, Jim (20 September 1998). "If the face looks familiar, think back 25 years to..." Chicago Tribune. Retrieved 18 February 2011. ^ a b Schneidman, Dave (2 April 1985). "Frazier Thomas Suffers Stroke". Chicago Tribune. Retrieved 18 February 2011. ^ a b Best, Patricia (19 May 1985). "The Children's 'Prime Minister'". Chicago Tribune. Retrieved 12 February 2011. ^ Johnson, Allan (3 April 1988). "At 50, WGN Finds The TV Picture and Audiences Have Changed". Chicago Tribune. Retrieved 17 February 2011. ^ "This classy portrait by Roy Brown of Garfield Goose adorned a wall on the set of "Family Classics."". LA Times. Retrieved 26 June 2011. ^ Okuda and Mulqueen 2004, pp. 60-62. ^ Berger, Daniel; Jajkowski, Steve, eds. (2010). Chicago Television. For the Museum of Broadcast Communications; Foreword by Bob Sirott. Arcadia Publishing. p. 168. ISBN 0-7385-7713-8. Retrieved 18 February 2011. ^ Pridmore, Jay (12 June 1992). "Lights, Camera, Action..." Chicago Tribune. Retrieved 7 March 2011. ^ "Frazier Thomas". TV Acres. Archived from the original on 17 September 2012. Retrieved 10 February 2011. ^ "Bozo Timeline-1970s". WGN-TV. Archived from the original on 18 December 2000. Retrieved 16 February 2011. ^ a b "Bozo Timeline-1980s". WGN-TV. Archived from the original on 9 July 2001. Retrieved 16 February 2011. ^ Hollis 2001, p. 97. ^ "Photo-Frazier Thomas Uniform at Museum of Broadcast Communications". ShepTalk. Archived from the original on 16 July 2011. Retrieved 10 February 2011. ^ "Photo of Garfield Goose character puppets with Ali Gator at Museum of Broadcast Communications". Flick'r. Retrieved 13 February 2011. ^ "WGN-TV Studio 1 Plaque Photo". Mark DeCarlo. Retrieved 9 February 2011. ^ "WGN-TV Studio 1 To Be Honored For Its Historic Role In Children's Television". Museum of Broadcast Communications. 5 December 2005. Archived from the original on June 28, 2011. Retrieved 10 February 2011. Okuda, Ted; Mulqueen, Jack (2004). The Golden Age of Chicago Children's Television. Lake Claremont Press. ISBN 978-1-893-12117-1. Wikimedia Commons has media related to Frazier Thomas. This page was last edited on 31 October 2018, at 21:35 (UTC).